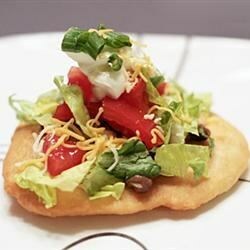 These are awesome for just the Fry Bread alone! Best Bonus: I found that they make up quite large and only 1 taco filled fry bread can easily satisfy my teenage sons! Everyone like the taco's that way for a change. Yummy too for doing a dessert with the cinn/sugar/honey & also try it with ice cream. **Update** I have made these several times per the resquest of my teens--the first few times I struggled a bit with the dough. Hints to help make the dough easier to handle: 1) I scalded my milk before adding to flour mixture. 2) Make sure you knead it at least the 5 min. 3) Make sure your oil is a 365.